The Manduka eKO is a top of the line, award-winning yoga mat that very well deserves all its praises and achievements. Most often compared to the Jade Harmony Professional, the Manduka eKO is further elevated in particular ways that justifies its praises. The skinny Manduka eKO is made of rubber without the frailties and limitations of rubber. The Manduka eKO an added top layer to help maintain the integrity of the rubber below. Now, you get to enjoy the feel of a rubber mat, especially its traction, without it easily breaking down. Though the technology applied in the top layer subtly decreases traction, the Manduka eKO remains fantastic and highly durable compared to other rubber mats. It is compact, though a bit heavy, but highly transportable yoga mat that will be convenient for your everyday use. It is not cheap, but it is also not expensive – you’re going to get all the amazing features at just the right price! This fantastic rubber yoga mat is made from biodegradable non-Amazon harvested rubber and sits at 5mm thickness – or thinness! It is by far one of the slimmest rubber yoga mats on the market and offers both the incredible feel and traction of a rubber yoga mat. Not to mention it is biodegradable – so you won’t have to feel guilty if you need to dispose of the mat. The Manduka eKO comes in two sizes – standard and long. The standard size is 71 inches long and 26 inches wide, while the long size is 79 inches long and 26 inches wide. The Manduka eKO is composed of two layers – the rubber mat’s bottom layer is built with open-cell construction typical of most yoga mats, and the top layer is built with a sealed-cell construction that offers impermeability and increased durability. Moreover, the Manduka eKO is 99 percent latex-free (as claimed by Manduka). So, you can enjoy this remarkable mat without worrying too much about the effects of latex on your skin and/or body. Nevertheless, we recommend you stay away from it if you have a latex allergy because this rubber yoga mat may sometimes contain very small amounts of natural latex, which potentially triggers reactions. 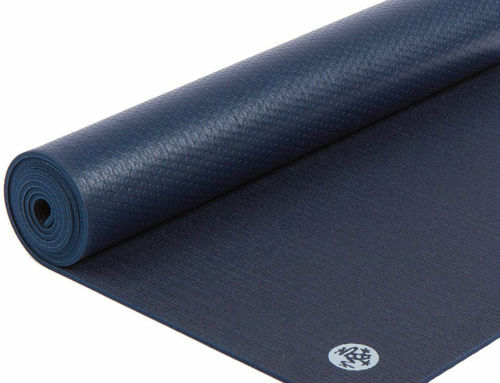 The Manduka eKO proves to have one of the best traction for a rubber yoga mat. You’ll find yourself sticking like glue, unlike most yoga mats where you feel like slipping and sliding. Doing a Sun Salutation is never easy, especially when there’s less traction, but with a Manduka eKO, you’ll be amazed at how you can perfectly pull it off firmly. The traction in the Manduka eKO with dry practices performs a lot higher than other yoga mats in the market. There are other mats that perform better but those usually range in the much more expensive category. What’s great about the Manduka eKO is the slightly tacky feel the moment your hands and feet set to it. Imagine doing a Downward Facing Dog, where you have to raise your rear facing the sky, you’ll be amazed at how you are firmly fixed to the mat in your position. This is not an easy feat, especially for yoga mat designers and manufacturers. 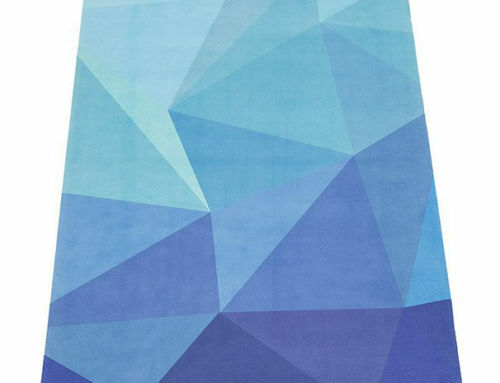 Most yoga mats tend to disappoint, and you’ll have to make do with what you have. It took Manduka to develop the Manduka eKO over four years to perfect this and with the help of expert yoga teachers, the Manduka eKO achieved the required traction, per the expert’s recommendation, needed for an enjoyable and safe practice. Great traction is a requirement for a yoga mat – it is one of the critical features needed and the one that you should be looking for when buying a yoga mat. Traction basically makes or break a yoga mat’s reliability against slipping during practice. A slight slip can easily result in an injury. It’s important that your hand or foot is firmly gripped to the mat during practice, otherwise, something undesirable would happen. Moreover, a yoga mat that is slippery requires you to exert a lot more effort in order for you to hold a pose. This becomes dangerous when you are distracted and/or bothered about shifting or slipping. This becomes really annoying and turns into a hassle when performing practices that require shifting to any kind of flow styles with various vinyasas as well as Down Dogs. Traction becomes more and more critical and required considering the dangers of getting injured during practices. Certainly, you don’t want to sacrifice your health just to save a few bucks or because all you really wanted was the brand. The Manduka eKO provides you that reliability and traction for a more safe and enjoyable practice. Sweating is normal, especially when you’re starting to build up your internal fire performing different poses during practice. Regardless of whether you’re practicing in a heated room or not, your body will definitely generate as much sweat the moment your passion rises up to the demands of the pose as well as your inner fire’s build up. The real test of the yoga mats begins with the sweat generated by your body and those that come out of your palms. In most cases, yoga mats lose a little bit to a lot of traction during wet practices. Other more expensive yoga mats apply texture into the top layer of the mat to keep traction. The Manduka eKO, on the other hand, has a smooth top layer that unfortunately shows loss of traction during wet practices, especially when sweat comes to shove. This maybe is a little of a downside for the Manduka eKO. Nevertheless, it still performs better compared to its competition. What’s surprising is that it performs head to head with the more expensive range of yoga mats. The upside is that the Manduka eKO’s smooth top layer repels as much wetness to keep sweat from seeping into the inner layer of the mat. The benefits of this outweigh the downside. This feature prevents bacteria from building up within the mat since the mat’s feature keeps it completely dry as much as possible. Moreover, the likelihood of wear is decreased since there’s no wetness that will stay within the layers of the mat. This amazing upper layer sealed-cell technology applied in the Manduka eKO is a return of investment for you. Less sweat absorbing into the yoga mat, fewer bacteria build up and less wear over time of use. Now, in a lot more heated yoga practices, such as the Aurorae Synergy and/or the Kulae Elit Hot Hybrid for the Hot Vinyasa and Bikram-style classes, respectively, it is highly recommended to use a hot towel over the mat during practice to keep the sweat absorbed into the towel. This is also applicable to Hot Pilates practices. The Manduka eKO exhibits perfect comfort and stability for a rubber yoga mat. Whereas most yoga mats sacrifice one for the other, the Manduka eKO provides you both and remarkably performs in high expectations. Its 5mm thickness doesn’t feel too squishy underfoot plus the Manduka eKO’s heaviness ensures that the mat stays in place even when you’re moving around during the whole practice. It is much obvious when comparing the Manduka eKO to other mats during highly dynamic yoga practices, such as shifting from Downward Facing Dog to a standing pose. The Manduka eKO will stay in place the whole time offering you confidence and security during the whole duration of the practice. Even when performing challenging arm balances as well as inversions. The underfoot grip is highly applaudable and provides a great deal of comfortability. Balancing on one leg or two hands are pretty much easy without worry. This Manduka eKO feature is a critical win when buying yoga mats. We highly recommend the Manduka eKO if you’re looking into a tighter underfoot grip. 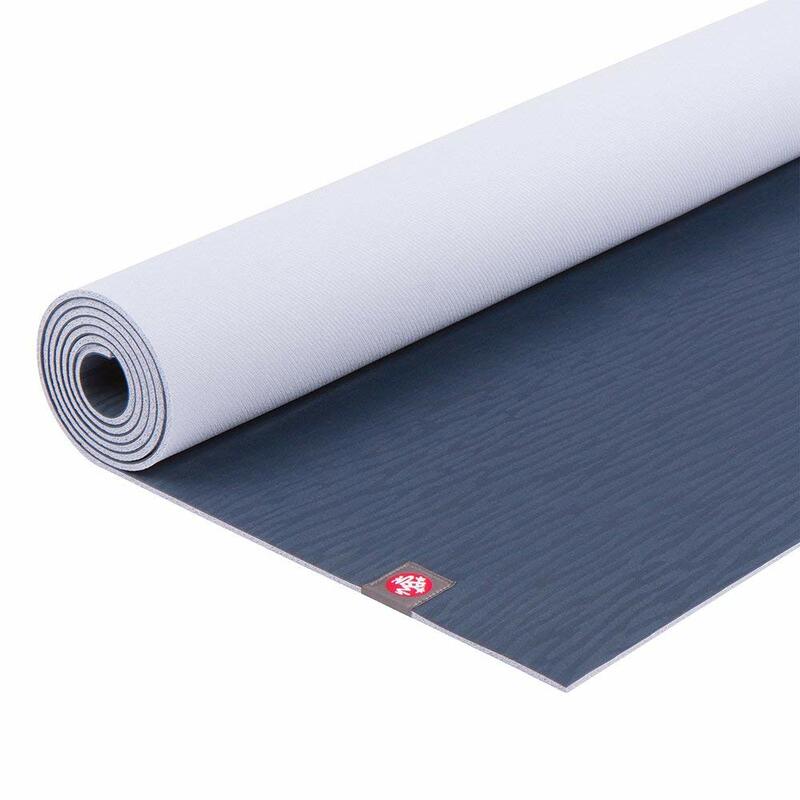 The Manduka eKO’s amazing sealed-cell technology applied to its upper layer provides greater durability for the mat. The rubber mat’s amazing traction and feel are like no other. They’re really great for practicing Ashtanga Vinyasa styles of yoga but the rubber mat’s intrinsic characteristic makes it a poor choice when you’re looking for a mat that will stay longer and reduce wear. The Manduka eKO is the mat that you’re going to need if you’re looking for similar traction and feel and longevity potential. The Manduka eKO proves very remarkable in those practices and even in heated rooms. The wear is greatly reduced because the sweat is repelled reducing any likelihood for wetness to seep into the mat’s layer. However, one thing to keep in mind is like all the other rubber mats, the Manduka eKo should never be left in direct sunlight and/or inside a hot car for a longer period of time because the rubber’s material will highly break down in direct or prolonged exposure to heat. The Manduka eKO is a bit on the heavy side and that’s normal for its material. The Manduka eKO weighs 6 lbs 8 oz, a couple of lbs heavier than most yoga mats. However, the Manduka eKO rolls up compactly and a lot easier; surprising for its heaviness. It’s not entirely difficult to tote around. Moreover, the Manduka eKO is a little bit wider compared to other yoga mats and slightly thicker, even in its slim design of 5mm. It provides a little extra coverage for its dimensions though a bit shorter compared to other mats that are 74 inches long. One of the best features of the Manduka eKO is its ease of care. 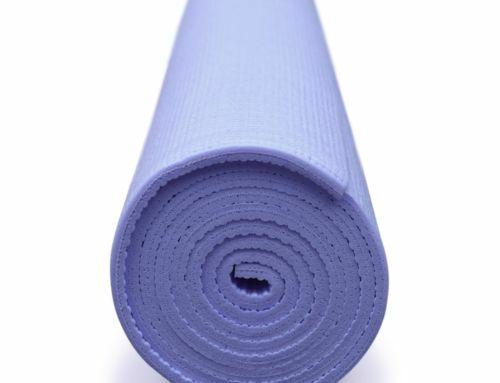 It is much easier to clean than most of the other yoga mats with texture applied on the top layer. The Manduka eKO’s smooth top layer pretty much repels not only wetness but also dirt, lint, animal hairs, and other dust elements. You can easily clean it with a mat spray and towel without putting a lot of effort into it. What Manduka eKO recommends for cleaning the Manduka eKO is a mixture of 50 percent water and 50 percent apple cider vinegar. It is much simpler and cheaper. Keep in mind that soaking the Manduka eKO will not clean it and will only make the mat brittle. So, keep the mat away from the tub or the washing machine. The water-apple cider vinegar solution will do the job of cleaning it clean and keeping the smell fresh for every yoga class. When to best use the Manduka eKO? The Manduka eKO is versatility in a slim package. That said, it works well for any number of yoga styles. Whether you’re doing a Sun Salutation or Downward Facing Dog or performing in heated or non-heated rooms, it’s remarkable. It has enough cushioning as well as wider coverage for Yin yoga practices. It also has the needed durability and traction for Vinyasa yoga styles. It may not be really a great choice for Hot Yoga but it’s not bad a choice. Nonetheless, it performs its weakest in Hot Yoga practices. For all other styles, the Manduka eKO is remarkable and fantastic. The Manduka eKO is the best overall, versatile, rubber yoga mat that is not only reliable and durable but also relatively reasonably priced. Performance-wise, it excels in pretty much everything and the features hit the right requirements. It is a great investment for every type of practice without having to worry about any major downside and/or limitation. Not only does it offer great feel, comfort, and traction, but it is also highly reliable and durable, and it exceeds most expectations.